Today I want to show you how to conduct a simple survey using a chatbot in Facebook Messenger, like this one. Checkout our Facebook Messenger hacks! Why a Facebook Messenger survey and not an email survey? 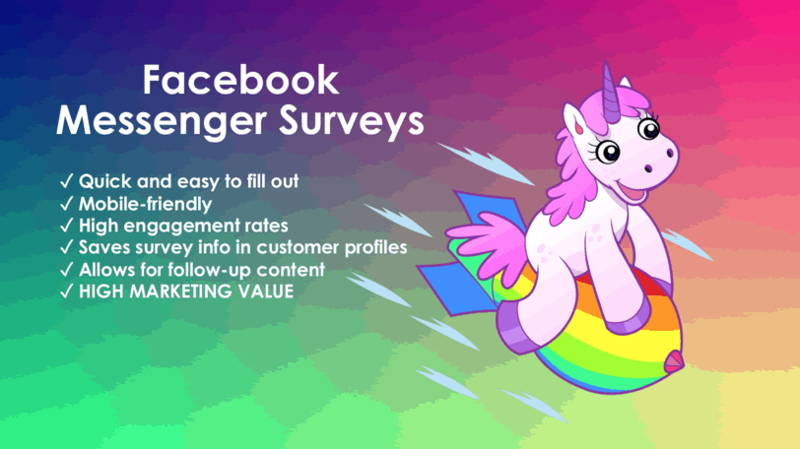 Email surveys are donkeys while Facebook Messenger surveys are magnificent unicorns. Of course Facebook Messenger surveys do the job of collecting market research. But the best part is that by doing a survey, you’re adding to a customer’s profile — and you can use that data to create audiences and inform future follow-ups via Messenger. The example chatbot I built here took about 10 minutes to design, build, test and launch. 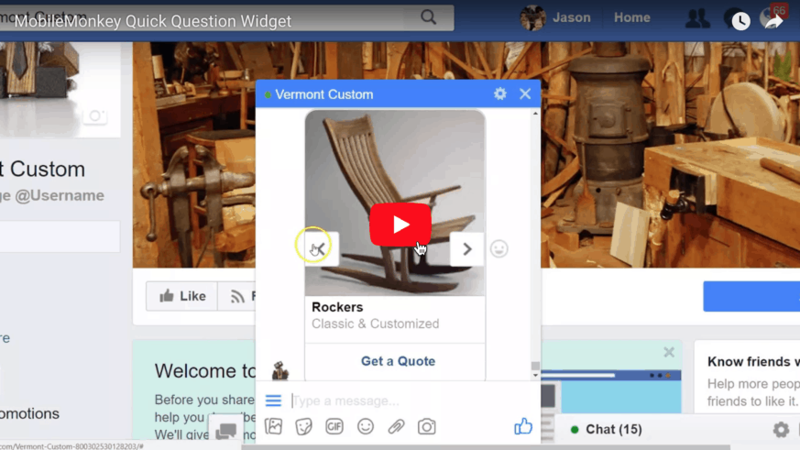 Build your Facebook Messenger survey using Quick Questions. Add a variable to save critical survey response data to your Facebook Messenger contacts. Bonus step: Blast follow-up messaging to your new audiences! Step 1. Build your Facebook Messenger survey using Quick Questions. In the chatbot builder, create a new group for your survey questions. Note: You’ll want to check out this guide on how to come up with meaningful survey questions. We’ve got a Quick Question video tutorial if you want to see how to add this widget to your chatbot. Each survey question should be its own page in the group. This lets you link to the next quick question after they’ve answered one question. When you’re designing your survey, you can choose multiple choice or free-form text responses. If you’re looking to reduce friction and improve response rates, go with multiple choice buttons. Look how easy it is for respondents to pick an option! Smooth, right? OK, so this next unicorn hack is the key to taking surveys to the next level. Step 2. Add attributes to save critical survey response data to your Facebook Messenger contacts. 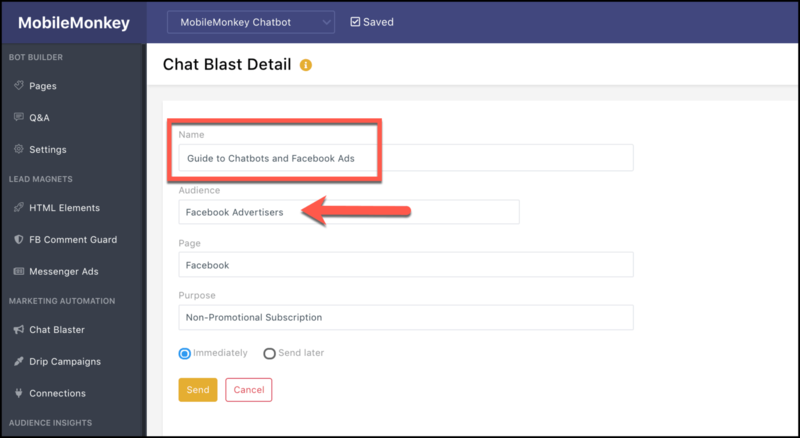 When you collect survey data with Facebook Messenger automation, you get customer info you can use for future outreach. So for example, if it turns out that most of our audience advertises on Facebook, we can blast Facebook Ad-specific content to these people. See where I’m going with this? Step 3. Export your survey responses. First, go to the Contacts tab and click “Export” to download your contacts as a .csv. Then, open the report in Excel to see people’s contact information along with their responses. And that’s how you slice and dice your survey responses! Bonus Move: Blast new audiences with follow-up content in Facebook Messenger! 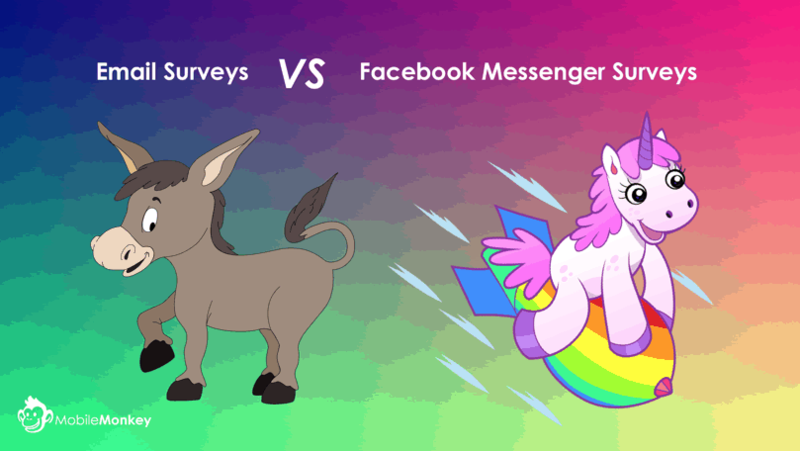 The final blow in the battle of unicorn Facebook Messenger chatbot surveys against donkey email surveys is follow-up messaging. And blast them with tailor-made content they’ll love! Doing surveys in Facebook Messenger is more than market research. It’s a way to nurture customers, fill out your customer profiles and reach people with more relevant content. 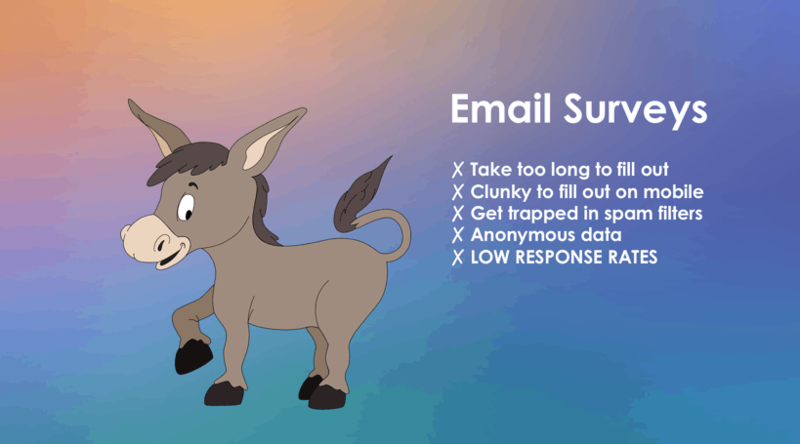 Don’t leave half the power of surveys on the table by using clunky, laborious and spam-filter trapped email surveys. Thanks for joining us on this epic journey from donkey-email survey land to unicorn-chat-messaging survey land. Say no to stupid email surveys.